Saturday 17 and Sunday 18 April, I spent in Prudhoe and Blanchland, Northeast England, completing my Expedition module training of the SMBLA accredited courses, under the able guidance of Neil Slater from cycle4adventure. 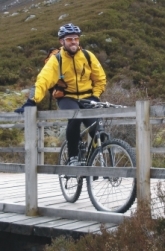 This is an add on module which allows both Trail Cycle Leaders and Mountain Bike Leaders to guide entirely self-supported groups of mountain bike riders on multi-day trips in their respective terrain (TCL or MBL). Day one was mainly classroom based and involved discussing equipment, primarily trailers and camping gear, but also food and other necessities. Setting up and packing up camp was also practised. A short test ride with trailers followed and plans made for the guided ride the next day. A 9 o’clock start from Blanchland, a picturesque medieval village set in a valley nestled in the north-eastern Pennines accessed by steep approach roads, was the setting for the start of the ride. Trailers were hooked up to the bikes and loaded with all the gear and off we set. After a 3/4 hour ride up over the fell and into the woods, Neil and I found a comfortable spot to set up camp and cook lunch. After we refueled, the camp was packed up again and we set off to ride some single track, our trailers still in tow. The trailers easily took everything in their stride and even descending steep technical single track was not a problem for either bike or trailer. We were both using “extra wheel” trailer set-ups. Eventually the fun came to an end when we reached the car park in Blanchland again and had to unpack and decouple the trailers. After some more discussion we called it a day. I must say, this was some of the best fun I have had on a mountain bike, even though it was slightly more work uphill lugging 15-20kg extra. I look forward to undertaking the assessment in early August and more mountain bike tech discussions with Neil. An update will follow once completed. 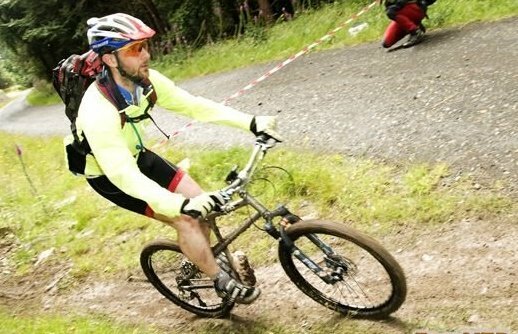 In the last months I have been busy completing my Scottish Mountain Bike Leader Award (SMBLA) level 1 Trail Cycle Leader (TCL) and level 2 Mountain Bike Leader (MBL) awards. For those of you who may not be familiar with the afore mentioned body and awards, it is probably the most widely recognised mountain bike leader qualification worldwide, allowing you to lead groups of mountain bikers on tours, as well as teaching aspiring riders the skills necessary to tackle the terrain and multitude of natural obstacles often encountered while mountain biking. In late January I attended the TCL course run by Traja Owens from biking.ie. Part classroom, part practical based, it was run out of the Outdoor Education Centre in Kilfinnane, Co. Limerick with the rides taking place using the Ballyhoura Trail Centre venue. This was my first time riding the Ballyhoura trails, which I can only describe as world class. Designed by world renowned trail designer, Daffyd Davis, who has also designed the mountain bike cross country course for the London 2012 Olympics, there are a total of 96km of 5 stacked single track loops, the longest one totalling 51km. I returned to the same venue mid March for my TCL assessment with SMBLA tutor Jonathan Collins from 1bike1.co.uk to successfully wrap up my level 1 certification. The next obvious step was to progress to the MBL level 2 award. I met up with Jonathan as he was running an MBL course out of the National Mountain Centre in Plas-y-Brenin, Snowdonia National Park, North Wales. Accommodation and food were included in the price of the course at the centre, which helped make it an enjoyable and relaxing stay. Again, it was part classroom, part practical based and the rides on both days were in Snowdonia National Park taking in some of the most breathtaking scenery. The weather was damp, but thankfully the heavy rain held off until just after we had returned from the ride on the second day. I now look forward to eventually completing my MBL assessment in early May, all going to plan. You are currently browsing the archives for the Scottish Mountain Bike Leaders Association category.